Frame's attributes: offset and transparency. Each image has individual offset. 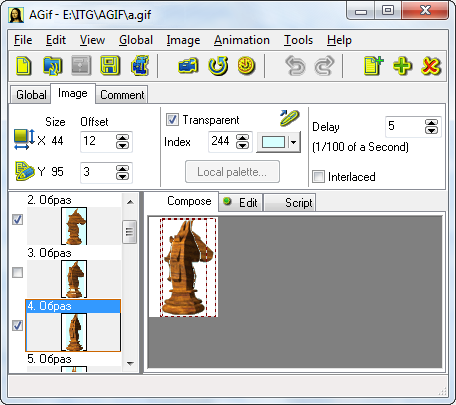 You can define offset of separate image by means of spinedits on tab Image of Attribute Toolbar or by image dragging by mouse. Status Bar displays current mouse coordinates. Checked flag Logical screen Auto on tab Global of Attribute Toolbar means that size of logical screen will be recalculated after any image offset. See also image offsets- one of the tools for GIF- file optimization. Images in GIF- files have transparency attribute so that one color in the image is not displayed. This allows a web-page's background colors show through. Initial transparent color of added image is the color of the lower left pixel. Property "transparency" of new image is defined in dialog File / Preferences on tab New. Transparent color is selected from active (local or global) palette. You can select another transparent color directly from image on tab Compose of Image Area. Click button on tab Image of Attribute Toolbar and move mouse over image. Click on necessary image color to fix selection. List of images has checkboxes to display images from different frames simultaneuosly on tab Compose. It helps you to see how one image is placed relative to other image. If demanded you can set transparent background for overlaid image. See also: frame operation merge.